Fountain Street NE will be closed from Lafayette to Prospect avenues from April 23 to 26 for utility work. The suggested detour route is from Lafayette to Fulton Street to Prospect. GRCC’s chapter of Gamma Theta Upsilon, the international geographic honors society is hosting the last of its food drives for this academic year, with a pickup scheduled for noon Wednesday. You can drop off items in the Dean’s office in room 310 of Raleigh J. Finkelstein Hall (formerly the Main Building) or at the Social Sciences Department offices, on the second floor of White Hall. GRCC’s baseball team enjoyed a perfect 4-0 week. Softball was busy, playing eight games in five days, and golf got a few rounds in against some four-year schools, finishing fourth overall. The Raiders earned one of the their biggest wins in years, coming from behind against Kalamazoo Valley Community College on April 9. Down 7-4 in the first game, the Raiders got RBIs from Aaron Kietzman and Sierra Stoepker that tied it up going into the 7th inning. Alexa Abrahamson and the Raider defense retired the Cougars in order in the 7th and 8th. In the bottom of the 8th, Kietzman walked with one out, then stole second. Stoepker then hit a gapper to right center, sending home the winning run. In game two, the Raiders had seven hits, just one less than in game one, but fell to KVCC 14-1 in five innings. Stoepker finished the double header 4 of 7 with 4 RBI. The Raiders racked up 27 runs and 30 hits, picking up the sweep over the Ancilla College Chargers on April 11. 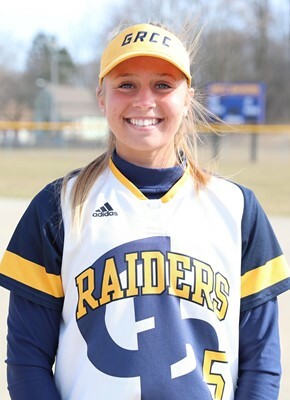 In the first game, the Raiders won 11-3 in six innings and got home runs from Madison Marble (her fourth of the year) and Mackenzie North, her first. Both two-run shots came in the six-run 3rd inning. North finished 4 for 4 with 3 RBIs. In game two, the Raiders were victorious 15-5, scoring in every inning but one — including seven runs in the final frame. Stoepker was a perfect 5 for 5 (including two triples and a double) with 2 RBIs. The 1st-place Lansing Community College Stars took care of the Raiders 8-0 in game one and 11-3 in game two on April 12. GRCC had 12 total hits, including three from Kietzman. The Mid Michigan College Lakers took care of the Raiders 8-5 and 7-3 on April 13. Andrea Chipman had three of the Raiders’ 11 total hits. Tuesday, April 9th vs. Aquinas College JV; The Raider pitching staff of John Sanocki, Garrett Cheslek, Logan Campbell and Logan Fleming combined for 16 strikeouts against Aquinas College’s JV team on April 9, giving up just 3 hits. 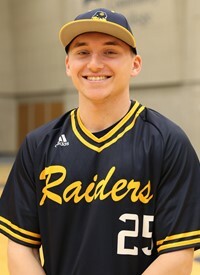 The Raiders won the ball game 9-2 and were highlighted offensively by a 4-for-5 performance from center fielder Dylan McMaster. He had two doubles and two RBIs in the leadoff spot. Sanocki earned his 2nd win. On April 10, 22 Raiders saw the field against Cornerstone University’s JV team, including seven pitchers, in a 14-3 nonconference victory. GRCC’s Trevor Patterson — batting over .500 for the year — was 3 for 5 with 4 RBIs, while Jordan Ball went 2 for 6 with 3 RBIs. The pitching staff scattered just four hits while striking out 11. 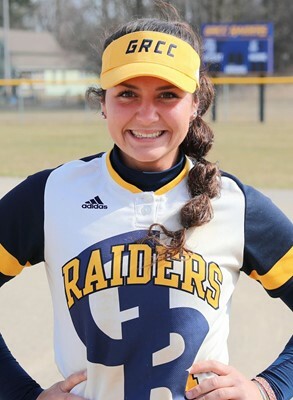 In a battle for third place in the conference, the Raiders played one of their best double headers of the year against Muskegon Community College taking down the Jayhawks 4-1 and 5-0 on April 13. Ace Jacob Wosinski nearly posted a shutout but a two-out HBP ended up scoring in the last inning. He finished with a superb 10 K – 1 BB game and allowed just three hits. Patterson led the offensive with two of the seven Raider hits. 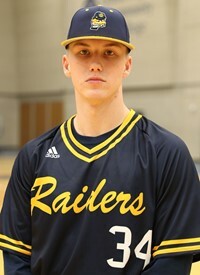 In the second game, the Raiders got the shutout, and Troy Hedges nearly pulled off the no-hitter but the Jayhawks had a double in the first inning. Hedges (3-1) had 12 K’s while walking just one. GRCC had 7 hits again, this time led by Calvin Syrjala’s 2-for-2, 2 RBI performance. Alec Lockwood had a big moment in the 4th, hitting his first home run of the year. The wins upped GRCC’s record to 10-4 in the conference and 15-16 overall. The golf team played at the Shootout at Stonehedge in the Battle Creek area on April 12 and 13 and finished tied for 4th out of eight teams. The other seven teams were all four-year institutions. The University of Northwestern Ohio won the competition, posting a 566 (-10) score. The Raiders tied Aquinas with a 632 score. After day one, the Raiders were five strokes behind Aquinas, but they shot a 306 on Saturday to finish tied. Cooper Bell finished 12th overall with a +11/155 score. 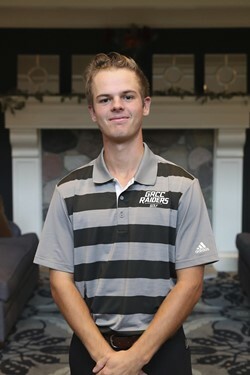 Logan Holtkamp posted a +13/157 score which was tied for 17th best. A Computer Information Systems student received the Arthur Andrews Award during a dinner Thursday honoring members of Delta Pi Alpha. Daniel Cruzan received this year’s award, which goes to the Delta Pi Alpha student with the highest cumulative GPA and the greatest number of honor points. The Arthur Andrews Award is given in memory of Grand Rapids Junior College’s second president.